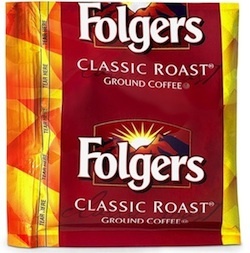 Folgers Classic Roast Office Coffee. This is the same Folgers Mountain Grown Coffee we have come to love. Comes packaged in a 42 count case. Each individually sealed pack makes one coffee service pot. This coffee is a little stronger and more full bodied than our Folgers Filter Pack. For those that prefer a "classic" coffee taste, this is a tremendous value, and good coffee.